Like Amelia’s Notebooks, these books have handwritten text and art on every page. 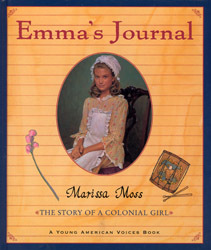 Unlike Amelia (which is based on me), I do a lot of research for these journals. It usually takes a year to read the more than 100 books that go into each of the ones I write. For me, it’s like going on vacation, imagining what it would be like to live in a completely different place at a completely different time. The life of a slave is the only life that twelve-year-old Galen knows, and though he hopes for a better one, he's making the best of it. He practices painting whenever he can, finds adventures with his best friend, Micio, and just might solve a mystery that will improve the life of everyone around him--and change the course of history. 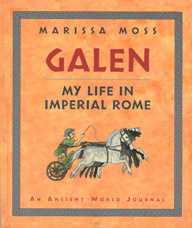 Galen, from the acclaimed author of the Young American Voices series, is a riveting first-person account of a young boy's life in ancient Rome. The Samuels family is made of tough stuff. That's a good thing, because it's another trying year in the Dust Bowl. Weeks pass without rain, and it seems that all the plow stirs up is dust. But fortified with hope, love, determination, and ingenuity, eleven-year-old Rose and her family weather the toughest of times. And although Rose's older brother, Floyd, prefers drawing to farming, he comes through when he is needed most, in his own special way. 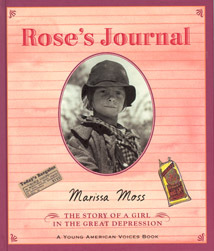 Carefully and poignantly rendered, Rose's story will linger in the hearts and minds of young readers. America! 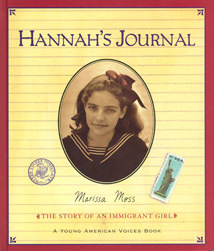 Hannah's small European village buzzes with tales of life in a faraway land free from persecution. Cousin Esther has passage for two aboard a ship bound for New York, and Hannah convinces Mama and Papashka to let her use the extra ticket. Will America really be everything they've dreamed of? 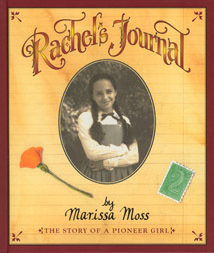 Traveling by covered wagon, young Rachel and her family follow the Oregon Trail from Illinois all the way to California. The terrain is rough and the seven-month trip is filled with adventure. Rachel's own handwritten journal chronicles every detail and features cherished "pasted-in" mementos gathered along the way.